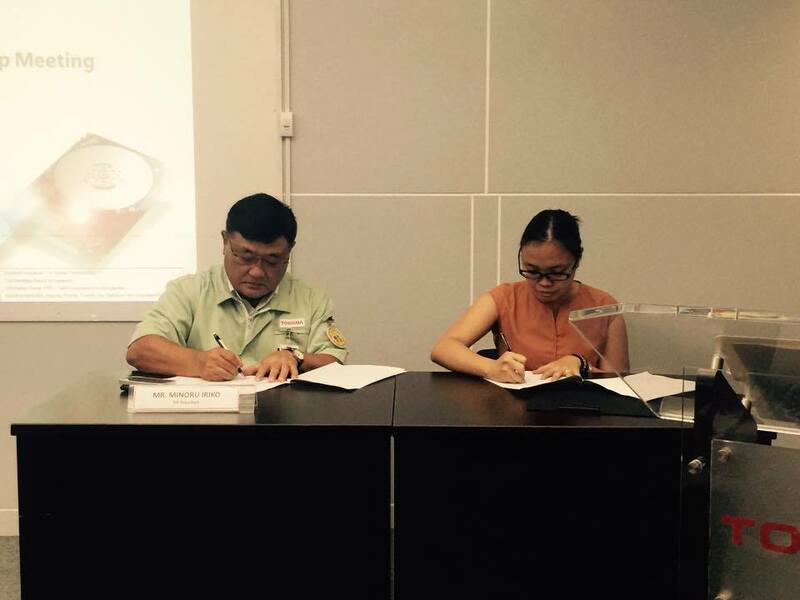 Envisioned to be a leading industry-linked educational institution, Lyceum of the Philippines Laguna (LPU-Laguna), through the Palaestra Consortio Office and the College of Engineering and Computer Studies, take another step further as a new Memorandum of Agreement was signed last Friday, June 26, 2015 between LPU-Laguna and Toshiba Information Equipment Philippines, Inc. (TIP). TIP is a subsidiary of Toshiba Corporation in Tokyo, Japan and was established in July 7, 1995. TIP produces mobile and enterprise hard disk drives and solid state drives and aims to be the number one total storage company in the world. TIP, based on its total commitment to people and to the future, are determined to help create a higher quality of life for all people, and to do its part to help ensure that progress continues within the world community. In connection with this, TIP decided to institutionalize multiple industry-academe partnership programs that will strengthen its partnership with the academe through technology and information sharing and program collaboration through plant tours, internship program, career assessment and job placement, and faculty immersion. Plant tour programs are guided exposures of students in TIP facilities that will enhance their learning experience in order to augment the theoretical lectures in the classroom setup. This program will cover the orientation on the TIP corporate profile, technology awareness talks, exposure to manufacturing technology and career orientations. Internship programs are supervised industry exposures to enhance theoretical learning through actual hands-on application of theories on different working environments. This program will include technology trainings, classroom trainings, technical assessments, behavioral assessments and other forms of assistance will be provided. Career assessment and placement programs help promotes the academes program on providing employment through Campus Recruitment and Job Fair participation. This program consists of In-campus recruitments, assessment interviews, career talks and mock interviews. Aside from these, TIP also provides relocation assistance, transition allowance and transportation assistance to provide a great employment opportunity for graduates from their academic partners. The faculty immersion program is a collaborative partnership between the industry and academe where faculty members from the academic partners of TIP are given industry exposure to acquire professional skills related to the courses they are handling by working in the actual workplace. This program encompasses technological exposure in the areas of HDD Technology, such as Mobile HDD and Enterprise HDD, SSD Technology, Instrumentation Measurement, IMTE, Failure Analysis, ESD Devices, and Contamination Equipment for cleanroom. This program also includes collaborative researches and assistance in the formation of an industry-based curriculum for students. Faculty members that will be part of this program will also be given allowances such as meal allowance, airfare/transportation allowance, board and lodging assistance and training allowance. In summary, TIP aims to strengthen Industry-Academe partnership with colleges and universities through collaborative information sharing on industry technology trends, and industry requirements. Furthermore, they provide the academe knowledge on industry requirement for more effective alignment of teaching strategies and class room instruction in order to develop and sustain an industry relevant level of class room instruction. They also want to introduce corporate culture to academic setting for better guidance of the students and develop insights and better understanding of the industry’s culture to prepare them for the challenges in the industry. Aside from these, they also want to create awareness to graduating students on available career opportunities in TIP.